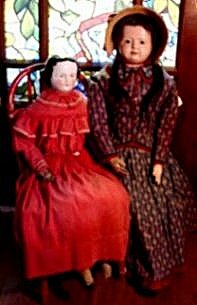 ...doll with the faded red dress never leaves the bedroom. Singled out from the other china head dolls...she is one of the babies I will not part with. Cool beauty is not her only attraction. She was given to me by my husband for a birthday long forgotten. Receiving her as a gift from someone who really did not understand why old soiled disheveled dolls kept invading his home...was probably one of the few times I have ever been left speechless...and was never able to convey how much this gift touched my heart. She has retired to her old red wooden childs chair...and though she was probably "created" sometime during the 1860-1880 period. I like to think of her as a survivor of the Civil War. She is a stately 28" with a cloth body and leather arms. I have always preferred China head dolls with this type of body...as china limbs can be reproduced...and some are excellent. I will just quote the article pinned to her when purchased. "Early French Paper-mache doll. Solid dome shoulder-head, set dark pupiless glass eyes, open mouth with two rows of split bamboo teeth, pierced nostrils, black painted pate with nailed on human hair wig, kid body. Circa 1840." Very heavy...very homely...very desirable to my nurturing nature. 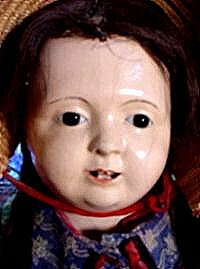 Not all dolls I have acquired have been in a presentable condition. Here is my take on selecting vintage/antique dolls "selecting dolls page"
"Top of the Collectors Biography Too Page"